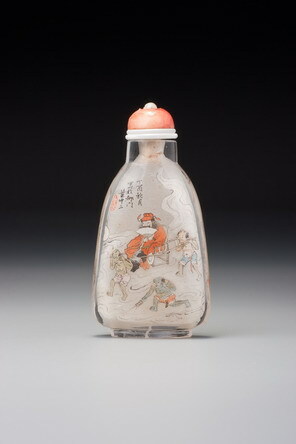 This is one of the most impressive snuff bottles in the Suzhou first-phase style (see discussion in Moss, Graham, and Tsang 1993, pp. 62–64 and p. 75). 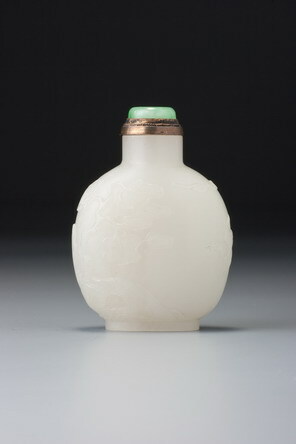 Near-flawless white nephrite of this kind, even when there are, as in this case, some tiny, almost invisible, more transparent areas close to the neck of the bottle, was beloved of the Suzhou carvers of the late Ming and early Qing dynasties. The control of the medium is masterly, with superbly fluid carving on several planes, giving the subject extraordinary life and conviction against a perfectly smooth ground plane. There is an unusual treatment of the large tree that is the dominant feature of one side of the bottle. The foliage is entirely made up of irregular shapes cross-hatched diagonally with a geometric pattern. Another example of this type of patterning of foliage on a high-quality carved snuff bottle is to be found on a Suzhou chalcedony snuff bottle, also now in the Bloch Collection (Moss 1971, p. 68, no. 178, and Kleiner 1987, no. 148), although a similar technique was occasionally used by the Master of the Rocks school. Finally it bears the name of the famous late-Ming Suzhou jade carver, Lu Zigang, in the customary relief script of the Suzhou school. Zigang never made any snuff bottles, having died long before the snuff bottle was invented, but his name continued to be used in Suzhou almost as a brand name. The subject here is the popular one of the theft of the peaches of immortality from the celestial gardens of Xiwangmu, the Queen Mother of the West, made famous in the Chinese allegorical novel Xiyou Ji (Journey to the West), published in 1592. This popular allegorical novel linked her to a group of pilgrims journeying to the West in search of Buddhist scripture and popularized a character called Sun Wukong, who is also referred to as the ‘Monkey King’. The crane with the tally in its beak is a symbol of longevity. This is based on a legend about a man who claimed that he had ten rooms full of tallies, each one representing one cycle he had witnessed of the sea and the dry land changing places. The crane, itself a symbol of longevity, is often pictured bringing a tally to a palace in the ocean.